Made with fresh spinach, garlic and parmesan cheese, these are perfect on their own, over linguini or in a sub. To me, Sundays mean relaxing, reading new recipes, drinking lots of coffee in my pj’s on the couch, and not having a care in the world. Instead, I woke up and went to town cleaning the house and doing a workout in the living room. Why, you ask? Maybe it was the large amounts of fries and vodka tonics I consumed last night, or that I had the whole house to myself this morning so no one could bother me. Nonetheless, the place is spotless and I’m feeling great! So naturally the next best thing is to try my hand at meatballs. Now I have failed twice at making meatloaf, which to me is the same thing, just a giant meatball shaped like a loaf of bread, so I thought, three times a charm?! Yes! I did it! These little babies are delicious and now I can’t stop eating them. Not to mention the Easy Skillet Marinara Sauce I made for dipping! Ryan requested Meatball Subs, so I picked up some Provolone Cheese and small loaves of Chiabatta bread, and voila – dinner in 30 minutes. Whats great about these are that they’re baked, so minus out the fat and calories from cooking them over the stove in some olive oil, and you can feel less guilty when your stuffing your face with these little goodies. 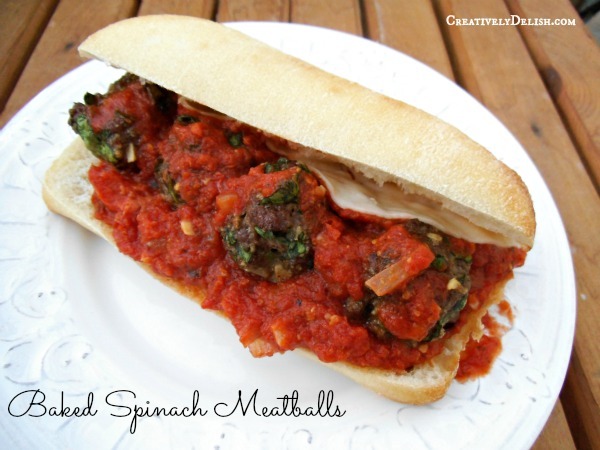 The spinach adds a bit more umph to them, giving more flavor, texture…and really what’s not good about spinach? I try to add vegetables to every meal I make and spinach is a great leafy vegetable filled with plenty of good-for-you nutrients. If you aren’t a fan of spinach, try shredded zuchinni and carrots – but really the taste of spinach is so mild anyways, that you may not even notice they’re there anyways! In a bowl, combine beef with all ingredients and mix together well. 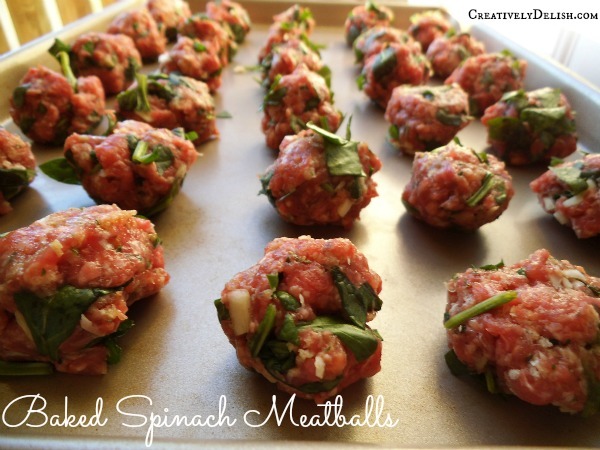 Bake meatballs in the oven 18-20 minutes or until fully cooked through. 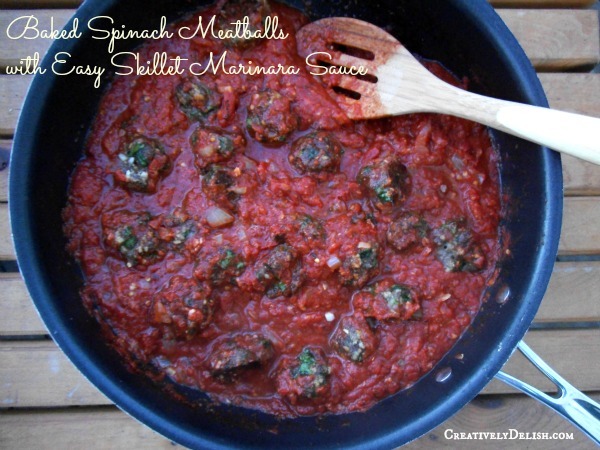 Serve with Easy Skillet Marinara Sauce. These sound awesome. My kids would love these too. Great way to add some spinach to their diet. Thanks Kate! Your website is beautiful with some wonderful recipes I’ll have to try! Absolutely delicious. Thank you! Do you happen to have the nutritional facts and serving suggestions? Thanks Sarah! I don’t have nutrition facts on my site but looking at the ingredients I would guess that one serving of these meatballs (about 1/2 cup of ground beef) would be under 300 calories. Hope this helps, and I will work on getting nutrition calculators up at some point! These are really amazing. I left out the parmesan cheese (I don’t mix meat and milk) and they still tasted great. I’m so glad you enjoyed the recipe!